Anyone who works with wood on a regular basis will understand that a wood router plays an important role when it comes to making a high-quality product with increased precision. If you’re new to using a wood router, then you’re going to need to choose a machine that performs the tasks you want it to complete, because believe it or not, not every wood router has all the features you need. So, to help you find the best fixed base router, we’ve compiled a list of the top rated wood routers that you can order online. 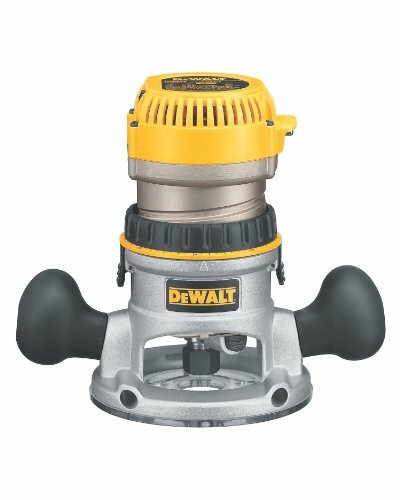 The DeWalt DW618 Wood Router is designed with a very powerful 12-amp motor that can deliver high-speed performances of up to 24,000 RPM. This unit is perfect for professionals who are looking to expand or upgrade their current router to a better model. This model can help get you an extra-smooth finish and can ensure that the tool will perform on the toughest of materials and hardwoods. The micro-fine depth adjustment ring allows you to get right up to your materials, giving you that perfect finish. This router provides an extra smooth finish to all of your work and can cut through the hardest of woods. It has a micro fine depth adjustment ring which can get as close to 1/64 inches. The sub-base gauge can help enhance your accuracy and help you maintain concentricity while in use. There are a steel motor cam lock and a quick release motor which can be adjusted to fit your needs. The router is over modeled and has rubber handles, which makes it easy to operate and gives you enhanced grip and control. The kit includes the motor pack, the DW618 base, ½ inch and ¼ inch collects, and a wrench. If you’re looking for a efficient and powerful wood router, then you’ve come to the right place. 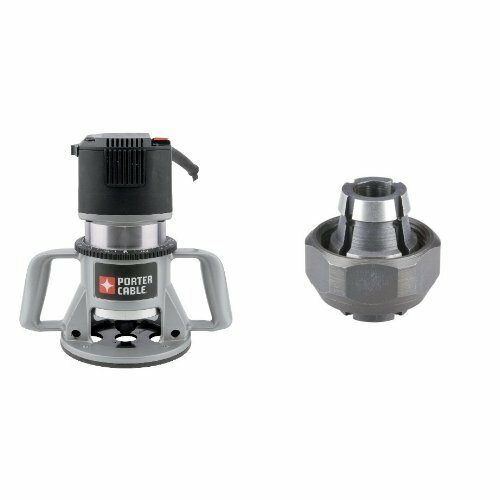 The Porter-Cable 690LR fixed base router is designed with a one ¾ horsepower motor that can generate up to 27,500 RPM. That’s an insane amount of power! There are ergonomic handles which are designed to give you better control over the device and are conveniently placed to make your life easier when it comes to routing. For added convenience, the router also includes two different collects; ¼ inch and ½ inch shank bits. 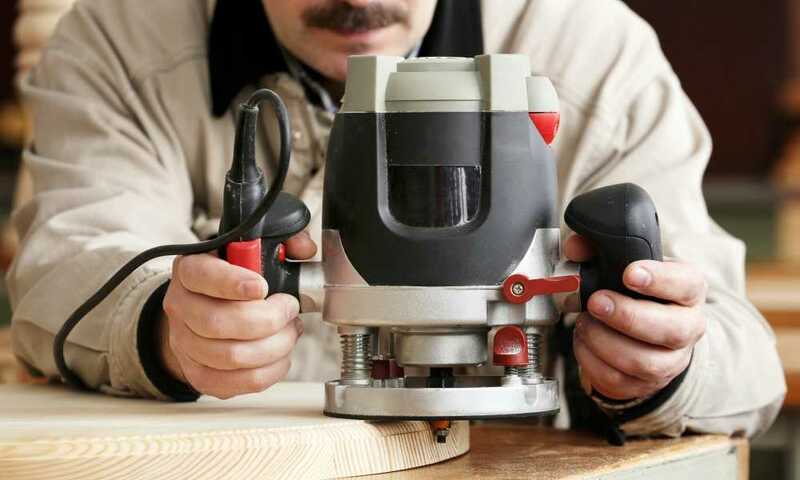 The Porter-Cable wood router is an important element to any woodworking businesses. The router gives a high performance and high speeds with the 11-amp motor. For a steady and consistent performance, the cam lock lever can help the simple coarse height adjustments stay in place as you work. A quickly fixed base motor will then release and allow you to adjust the motor pack between plunges. It’s accurate up to 1/128 inch and has a micro-depth adjuster to help ensure that the finish is very precise. Other features include an auto release collect system, an under the table stop, a rotating base, ergonomic molded grips, and a warranty. The Hitachi Power Tools brand wants to provide its users with professional-grade power tools for a variety of different applications. Some of these include woodworking, metalwork, concrete, drilling, fastening, and cutting. The Hitachi brand is a leader when it comes to power tools and research. Thus they provide you only with the best. Hitachi continues the tradition by creating the Hitachi M12VC wood router. It’s designed to be high quality and comes in a kit. The kit includes: M12VC router, ¼ inch collet chuck, 16mm wrench, centering gauge, 23mm wrench, hex bar wrench, and 10 hex socket HD bolts. The Hitachi M12VC is designed with a powerful motor and electronic speed control for making smoother cuts in a range of different projects. This makes it the perfect addition to any woodworker’s shop, as the precision router can help you select the correct settings. It has a quiet operation, speed control, and easy depth adjustments. 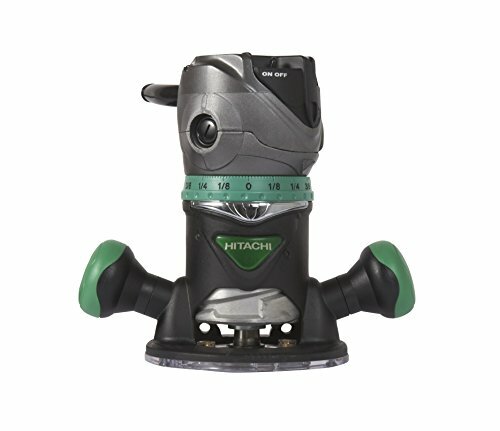 This makes it ideal for pattern cutting, fine groove cutting, window cutting, chamfering, trimming, and shaping. The M12VC has a powerful 11 amp motor which can get up to 24,000 RPM; this means the motor is super powerful. What makes it even better is the quiet operation which only gets to around 80 decibels while in use. The Bosch company has a broad range of routing applications that can work with the variable speed router. This router kit includes everything you’d need to power a motor with superior speeds. It has a fixed base for upright use, or you can adjust it to a table. It has plenty of high-performance features to help you get a variety of different jobs done as accurately and quickly as possible. Never again will you need to worry about your projects running slowly, as this device is perfect for long days of use. 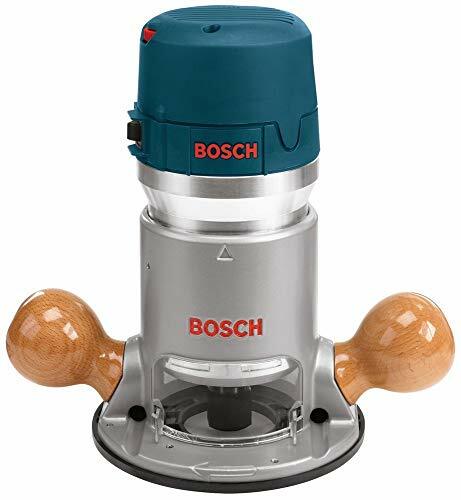 The Bosch 1617EVS wood router is designed with an extremely powerful 12-amp motor which can be changed of up to speeds of 25,000 RPM. The variable speed dial allows you to change the settings for the task you are trying to complete. It has a built-in constant response circuitry which will maintain an average speed throughout the session. It has an integrated soft-start feature which reduces the motor’s torque and allows you to have a smoother transition when you’re handling it. The kit provides you with all the components necessary for fixed depth routing. It has a microfine bit depth adjustment on the base and an accuracy of up to 1/64 inches thin. The kit includes the machine, ¼ inch & ½ inch collets, drop forged wrenches, chip field, above the table adjustments, mounting hardware. 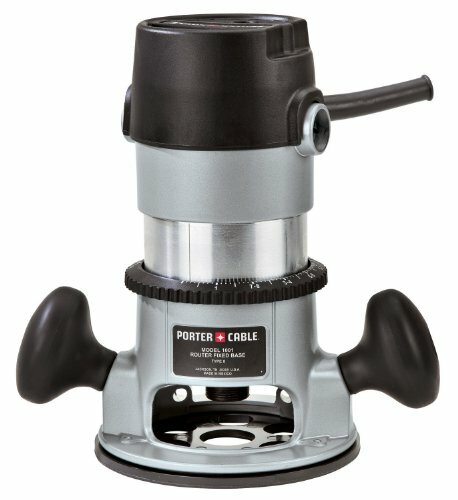 The Porter Cable 7518 wood router has five different speed settings which can be changed between 10,000-21,000 RPM. This means you can tackle a large variety of different jobs and tasks which require different speeds. The Porter-Cable router can help you improve your business’s productivity by saving you effort and time by working at high speeds and with increased durability. If you’re not completely satisfied with the unit, or there happens to be a problem with it you will be able to return it for a refund or to get it replaced. The company offers you a five-year warranty, ensuring that this product will last a long time. The unit runs at an all-time high of 15 amps and up to 21,000 RPM. The five different settings are 10,000/13,000/16,000/19,000/21,000. The soft-start motor and auto release collets ensure that your performance is smooth and will reduce the amount of torque at startup. The motor will be able to maintain a consistent speed under even the heaviest of conditions. The router has a sealed ball bearing design which can help keep the dust out of the components, thus exposing its lifespan. The motor is crafted from an aluminum motor which is meant to last. As previously mentioned, if you have any issues with the product you still have a five-year warranty on it. In conclusion, you can see that there are many wood routers out on the market. While we’d like to recommend all of them to you, you only need one. The best fixed base router that we could find was the Porter-Cable model. It has a powerful 11-amp motor, puts out a consistent performance, and has a cam lock lever which helps adjust it to your work surface. There are so many other features for this machine, and we highly suggest you check it out. If you’re going to be purchasing a router, we would always suggest that you double check and make sure that the projects you will be working on can be done by the machine you purchase. You will be able to see a visible difference in your woodwork when you compare it to your other pieces of work. All of these wood routers are designed to be high-quality, long-lasting, and durable. You can’t really go wrong when you’re choosing one from this list. All of the information is based on satisfied customers and honest reviews. Just remember, you’re going to have to learn how to properly use a wood router before you begin your journey and create your own masterpieces.